The weather so far this year has been pretty dull. Nothing but flat grey skies, so it’s great for working on some woodland photography (although a bit of fog would have been good). I managed to get time for a couple of walks around the forest and got these photos. I’ve always found woodland photography to be difficult; unless the conditions are just right (preferably some fog or at least heavy mist or maybe some snow), I’ve always found it hard to get a scene which isn’t messy. The first trip out was just after some heavy wind and there were quite a few broken branches. 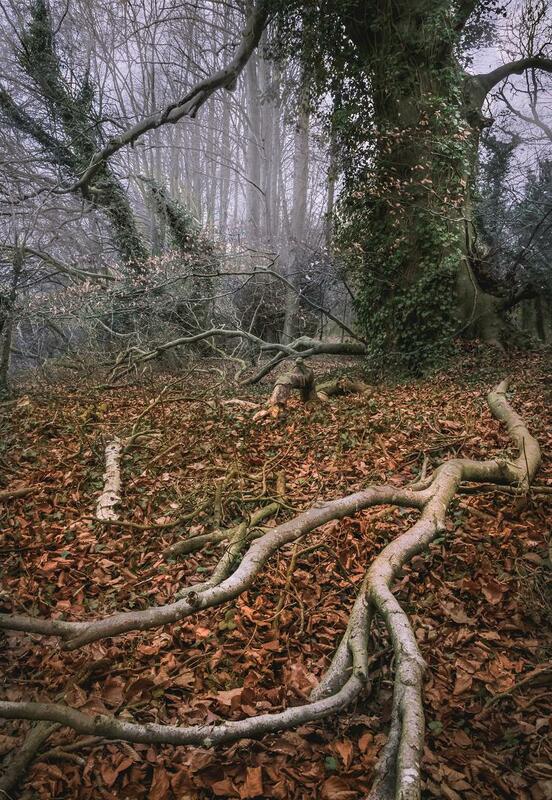 I got the photograph below almost at sunset, I was drawn both to the broken branch and to the three main colours; the red/brown of the leaves on the ground, the green of the ivy on the tree and the grey of the trees in the distance. It is actually comprised of three shots, the fist focussed on the branch, the second on the tree trunk and the third on the trees in the distance. I used Photoshop’s automatic align and blend tools to combine them into one photograph which is in focus from front to back. The next trip was a couple of weeks later after spotting a few things while on a walk with the dogs. 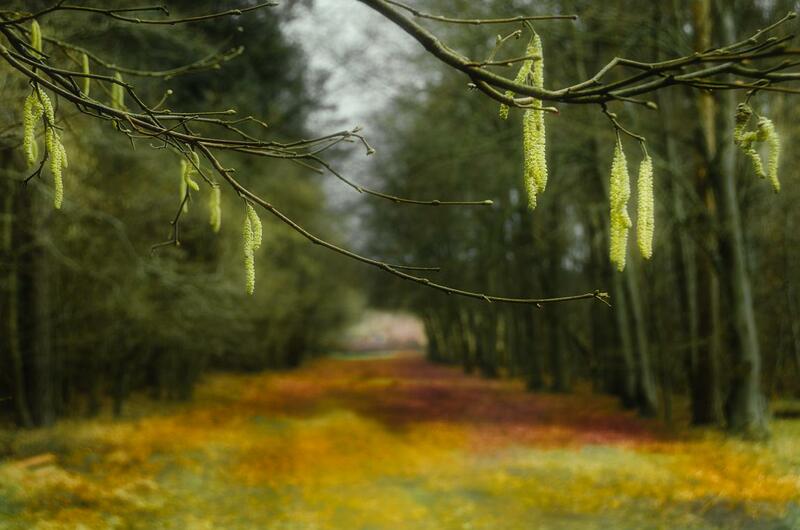 It was still dull and grey, but quite a few trees had bright yellow catkins which stood out against the background. To keep the background trees from being too messy, I opened up the aperture (f/5.6) and zoomed in to get a shallow depth of field. The exposure time was 1/25s, so I had to wait until any movement of the branch had died down before taking the photograph. 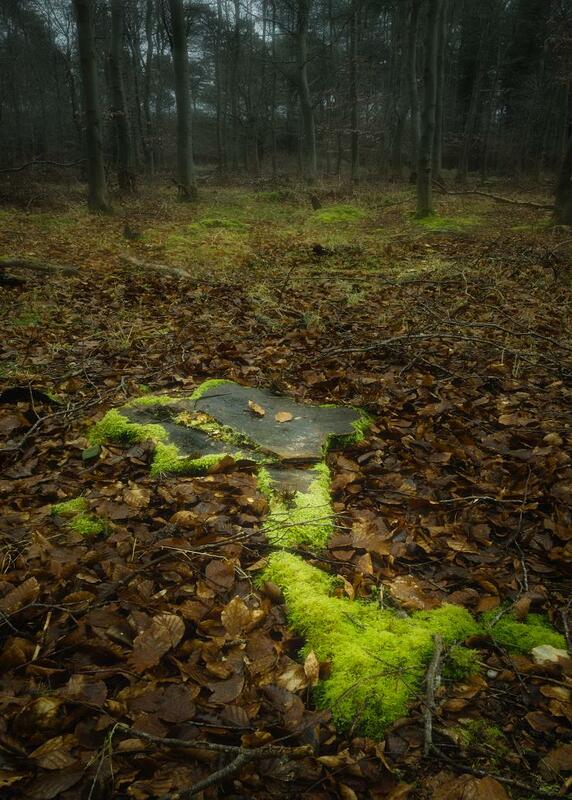 Next was the interesting shape made by a tree stump and some moss growing on and around it. 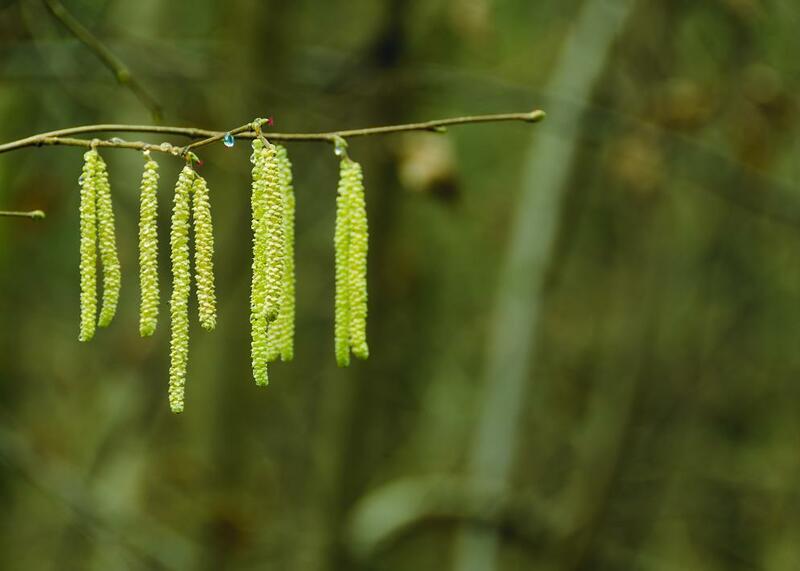 Next were more catkins. The background this time was a path through the forest into the distance. I took a number of images with the intention of focus stacking them, but in the end, I just used one. 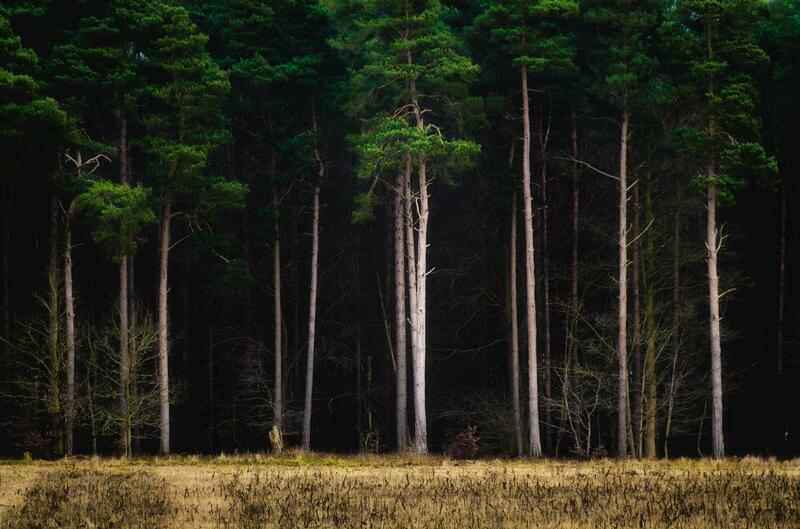 The last photo of the day was a bit different to the rest and was of some quite moody looking trees in the distance. This was taken zoomed in to 200mm (using a cropped sensor camera). I liked how the almost perfectly straight silver trunks stood out against the dark background. We actually had a nice sky yesterday. Of course I didn’t have me camera with me, so this is a photo taken with my phone. The row of trees in the background are the same ones in that last photo above.